Are you a family photographer who is always looking for great ways that you can pose a group to make it the best possible portrait you can? 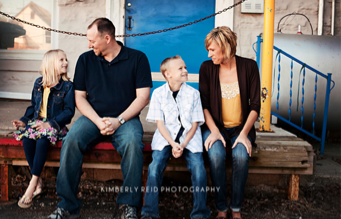 Learning The Basics of Family Photography, a guide by Kimberly Reid has so many great posing tips for photographers who shoot families! Today, we want to share with you 4 great poses for family portraits. This can give you some great new ideas and help keep your photos fresh with different and unique poses. Enjoy! 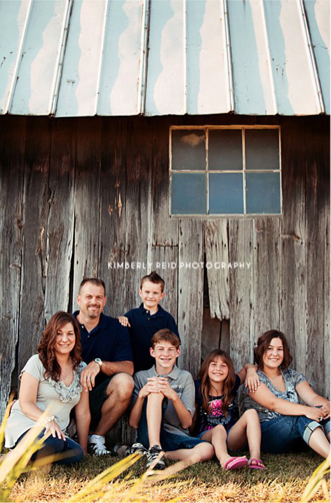 Here are 4 great ways to pose families straight from Kimberly Reid and the Learning The Basics of Family Photography. Height and variation are important when shooting a family portrait. You do not want to have everyone at eve level as that can make things boring. Having fun at a family photo session is so important and everyone loves to jump in pictures. Possibly have the children jump while dad is stealing a kiss from his wife. Just make sure you talk with your clients to make sure this is something they are all comfortable doing. You can find so many different locations that have a great ledge you can sit on. Perhaps a doc or a ledge outside of a really cool office building in the city. Alternating the way they sit from adult, child, adult, child to differentiate levels and keep the eye moving is important. With families, it is also fun to take some shots while they are all looking at the camera and others while they are looking at each other. This is a great pose where the parents look like they are a little timid about having their photo taken. They will be in the background but the focus will be on the kids. If you love the tips we have provided here, you have to purchase "Learning the Basics of Family Photography" today! With special code FAMILY240 you can save $240 (regularly $299.99) and you will get a 55-page guide for posing families and children along with 35 posing cards so you can take your tips on the go! Don't forget to use code FAMILY240 to save $240! Do you also photograph maternity sessions, newborns or senior photos? Kimberly Reid offers TONS more in her Posing Guide Collection. To see even more amazing ways to pose families, women taking their maternity photos, newborns or even senior boys, The Kimberly Reid Posing Guide Collection is a must! For only $84.99 (normally $599.99), you can get all 4 guides plus 154 posing cards so you can take these tips on the go! This is an amazing deal with savings of $514!! There are SO MANY different ways you can pose for a photo. You can be standing, sitting, lying, walking or even hugging. You can even be creative and come up with some really awesome poses that are uncommon. Whatever you do, there are still photography posing mistakes you want to make sure you do not make when you are photographing a client - or a group together. As a photographer, it is your job to help and coach your client along with various poses that will look great and flatter that specific person in particular. Here are 9 photography posing mistakes that you do not want to make that are very important to keep in mind. First and foremost, if someone is uncomfortable while you are photographing them, you will be able to tell and the photos will not be as wonderful as they could be. Talk to your client right before you start snapping shots, and make them comfortable. Also, during the photo process, keep it light and fun, so they can laugh, talk and relax. You may find it keeps them a little more relaxed while you are taking their photo. Try not to shoot someone standing with their shoulders squared to the camera. Shoulders are the widest part of the body and as a photographer, you want to flatter those "widest" parts of the body to make the subject of the photo looks as best as possible! So make sure your subject angles him or herself to the camera for a more slimmer look. Always try to have the person you are shooting keep their joints bent. If you stand totally straight at the knees and have your arms totally straight by your side, or your neck looking straight ahead, the person could end up looking very stiff in the photos. Bending the knees, elbows, and tilting the head a bit can make such a huge difference! It is best to shoot a person from straight on or even slightly above them rather than shooting them from below their eye level. If you are down lower than the person you are photographing, it is best to only do that during really artistic shots. If you work from above, particularly when you are shooting close up shots, it will get rid of double chins, it slims down the face, and if you happen to be shooting outdoors, it will bring the sunlight nicely into the person's face. It is never flattering to have your arms down so they look like they are glued to your body in your photos. Keeping them up on the hips or even holding an object helps with keeping the upper arm look thinner and also gives the subject a nice pose which also keeps the photo interesting and unique. Do you specialize in engagement or wedding photography and need a little extra help with posing couples? Look no further than this Posing Guide For Couple Portraits. For $299.99 (regularly $499.99) you can get this in-depth collaboration between BP4U and acclaimed photographer Beth of ENV Photography. POSING GUIDE FOR COUPLE PORTRAITS! Many people are not exactly sure what they should do with their hands when they are being photographed. Simply slipping a finger into a pocket of their pants helps immensely. If you are photographing a couple, have one put their hand on the other person's leg, or even holding hands makes it less awkward. If your subject is going to be changing clothes during the shoot, which many people do, make sure they do not have skin marks from the clothing they were wearing before as they can be eye sores in a photo! For example, if your subject starts off wearing boots and a sweater and then decides to switch to a dress, you want to make sure she does not have any marks on her legs from her boots or socks that would stand out in the next set of photos. Make sure you give your subject time in between if there are marks, or make sure to pose the person so you do not see them. If you are shooting a group of people and all of their heads are lining up at exactly the same place, the photo may end up looking very boring. Try having some people sit, while others stand to help break it up and add some dimension to the photos! While you are trying so hard to get the person in the the best pose you can, make sure you also consider what is behind them. The photo background is so very important! Always keep watch for those eye sores like street signs, a random car that may be parked, or even other people walking by that could disrupt the photo. You want to capture a beautiful background to make sure the subject is showcased in the best possible location! Need some extra help or additional ideas for posing? This Kimberly Reid Posing Guide is perfect for you! For $200 (a $599 value) you will get all of our Kimberly Reid Guides as well as 154 posing cards so you can take these tips on the go! CLICK HERE TO PURCHASE THE KIMBERLY REID POSING GUIDE! Do you have any other photography posing mistakes you try and stay clear of making? Tell us below!